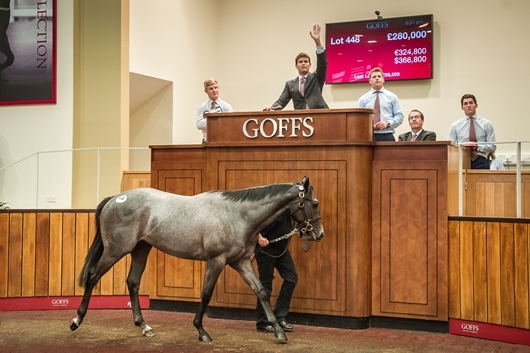 The upward spiral of the Goffs UK Premier Yearling Sale continued unabated over the last two days as new records were set following a record sale in 2015. A total of 32 yearlings surpassed the six-figure mark this year, driving the average up 3% to £44,078 and taking the turnover past £17.4 million with 23 fewer horses offered. A total of six horses made in excess of £200,000 and topping this year’s sale and matching the sale’s record for the third time in its history was Highclere Stud’s Dark Angel colt (Lot 448) who was sold to Peter and Ross Doyle for £280,000. The colt, out of a stakes winning Oasis Dream half-sister to Swiss Spirit, was purchased on behalf of Shadwell and will go into training with Richard Hannon. It capped off a huge sale for Yeomanstown’s Dark Angel who sired the top two lots and finished with an average of over £120,000. Earlier in the day Mark Richards from the Hong Kong Jockey Club went to £230,000 to secure Brightwalton Stud’s Acclamation colt (Lot 288), the second highest priced yearling today which marked the second six-figure purchase for the HKJC. First time vendors, Anna Drion’s Coulonces Consignment also featured prominently in the results with their Siyouni filly selling to Salcey Forest Stud for £220,000. "For the fifth consecutive year the Premier Sale has returned improved figures following two powerful days of sustained trade at a level we have not witnessed at Doncaster at any sale in memory. "Last year we celebrated 31 lots that made £100,000 or over and it has been pleasing to build on that again with one more £100,000 plus transaction. Every other stat has progressed as well with the average up 3% to a record £44,078, the median reaching a record £34,000 and all from a superb 87% clearance. To put this sale’s progress into perspective the average price has grown by a staggering 64% in just four years as it increasingly competes at a higher level for the type of yearlings that breeders never used to consider for Doncaster, a fact that is clearly illustrated by the median price climbing another 13%. "Indeed, the key to this sale has always been the individual and we can only marvel at how our vendors keep getting it right and upping the ante at the same time as for without the “Donny yearlings” for which the sale is renowned we have nothing. Add to the mix a real hunger from our buyers from home and abroad, and the result is the kind of consistently strong trade that we have witnessed over the last two days headlined by a record equalling yearling at £280,000 for the second consecutive year. "Sunny Donny has enjoyed great support from many quarters this week, not least GBRI who have introduced some key overseas buyers to our sale and we look forward to following the exploits of all the sales graduates next season and beyond."